Ireland West Airport is delighted to announce that Croí, Hope House and The Jack and Jill Foundation have been selected by airport staff as its charity partners for 2019. Every year, airport staff members have an opportunity to nominate a charity partner for the following year. The three charities with the most nominations are then selected as the company’s new charity partners. A number of events will take place during the course of 2019 which will engage passengers and staff with the aim of raising as much money as possible for the three charities. 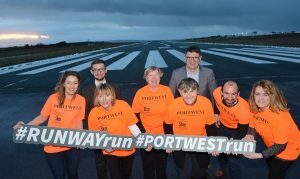 The headline event for 2019 will again be the annual 5k runway fun run sponsored by Portwest, which will take place on the runway at Ireland West Airport on Saturday March 30th at 5pm. Runners and walkers will take-off down the runway at 5pm and complete a 5km course with a difference. All are welcome to attend what promises to be fantastic evening for all the family, raising much needed funds our three charities in 2019. This year will be a particularly memorable year for the Runway run as it will be the last time a run will take place on the current runway which is due to be resurfaced in May 2019. The famous runway which was built in the early 1980’s has welcomed over 10 million passengers and this years run will be a historic one for those taking part. To celebrate there will be a number of prizes on the day for participants to have a chance of winning including flights to Barcelona, and Bristol. Entry to the event costs €20 per adult and €5 for under-16’s. A special family rate of €40 will be available for families of 2 adults and 2 kids. All participants will receive a race t-shirt and complimentary car parking and refreshments at the airport will be provided on the day. Participants can sign up and find more information by visiting www.irelandwestairport.com/runwayrun. The number of participants is restricted and those interested are advised to register early to avoid disappointment. Launching the charities of the year programme for 2019 and the annual runway fun run, Joe Gilmore, Managing Director, Ireland West Airport said “We are delighted to be partnering with three great new charities in 2019. This is the fourth year of our Staff Charity programme which has to date raised almost €100,000 for Irish charities. We hope to build on the success of the previous years and raise much needed funds for our three new charities this year who all undertake such fantastic work which really does make such a difference to the people that they support in our community. 2019 will be an extra special year as it will be the last time we have our Runway Run on the current famous runway, built in the early 1980’s, which is due to be resurfaced between May and July, so it will be yet another historic occasion for those taking part. historic occasion for those taking part. With the runway planned we look forward to supporting our three charities and to another successful year of fundraising”. Jackie O’Connor, Corporate Fundraiser, The Jack and Jill Foundation said “The Jack & Jill Children’s Foundation are very grateful to the staff of Ireland West Airport for selecting us as one of their charity partners for 2019. The Foundation works hard to deliver its service across the west of Ireland and beyond offering home respite hours and hospice at home respite hours to the very sick children under our wing. To date we have helped over 320 families in Connaught. We have no doubt this partnership will help us continue deliver this vital service and we look forward to the year ahead”. The New Year offers us a fresh start to make some changes in our lives. But change can be difficult and takes time and perseverance…research shows that only about 20% of people keep their New Year’s resolutions! 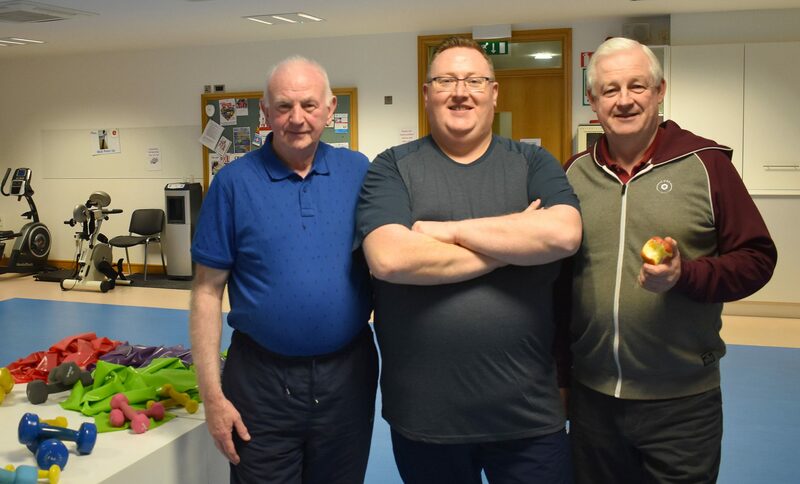 Máirtín Walsh, pictured centre, with long-time Croí programme participants Ger O’ Connell (left) and Kevin Martin (right). Máirtín Walsh is a dedicated Croí programme participant. 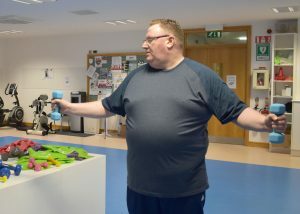 He completed the Croí CLANN programme (a specialised 10 week, healthy lifestyle initiative) in January 2018, and since then has participated every Tuesday in the Back to Fitness programme (a rolling 6-week programme, delivered by a Cardiac Physiotherapist/Physical Activity Specialist). “It’s not easy. 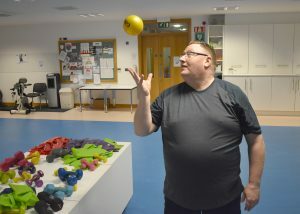 Every Tuesday is tough, but I can feel the benefits immediately,” says Máirtín. Eating healthier and exercising regularly will reduce your risk of heart disease and stroke, but you also get the added benefit of feeling much better and feeling more energetic. All it takes is a little patience and the right information. “It’s about changing behaviour. This is my routine now…It’s like going to work, visiting family and doing my Back to Fitness class every Tuesday. It’s part of my life now, and I’ve never once regretted going to a class,” says Máirtín. Don’t try to do everything at once. Changing the habits of a lifetime takes time and effort. “Set your goals and when you have achieved them, set some more and work on those. As long as you are working on your changes, then it is OK if it takes a couple of months to get everything in place,” advises Ailís, Physiotherapist at Croí. “Máirtín has been so committed and we’ve seen such an incredible change from when we first met him in November 2017,” says Ailís. “I was terribly unfit and I knew this would be a long-term project. I found it tough at first, but I enjoy it now and I look forward to it. It’s a positive part of my weekly routine. Croí was a launch pad for me…I just bought a bike and have started cycling to work. I’m also training for a 5km run. 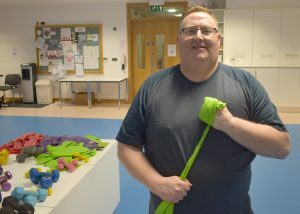 I’m not a gym person, but I love the group activities at Croí and how everyone is so supportive,” says Máirtín. 2019 is the year for a more healthy you! Learn more about Croí physical activity and exercise programmes here.